Consider that your AUT (Application under test) is Gmail.com or any other email application. The following are the list of features that we need to test – a high-level testing – not taking into account field level validations and such. The features are going to be part of a certain release that has a couple of cycles – We will see how through ALM we can define this information. Clearly, the above-listed items are your requirements. By definition, a requirement is a business need or a testing need. How do we write the requirements, create test cases, link them to requirements, create test sets and execute the tests, create defects and link them back to test cases and eventually to requirements, linking all the test assets (test cases, requirements and defects) on multiple levels to Releases and cycles are the things we are trying to learn through these tutorials. The release is nothing but a significant change or changes that are going live at a given time. Cycles are the different sets of testing efforts that are performed to facilitate the release. For example: From the above-listed features if you need feature 1 and 2 to go live on 30th May 2013 and the next 2 features on the 30th June 2013. You can name the first one “May release” and the second one “June release”. Each release comes with a predefined set of requirements that are expected to be done by a certain time. The phases are nothing but cycles. Each release will have different cycles within it. Both cycles and Releases have the start and end dates defined. We have outlines the release and cycle information in the form of a table above and we have captured all the information regarding it right here in this word document. Do you find yourself asking then why ALM? – Through ALM you can trace the release/cycle information all the way from requirements, test cases and defects thus ensuring complete transparency and traceability. Step #1: Login to ALM into with your username and password, into the domain and project you required. Step #2: Go to the sidebar options “Management->Releases”. Step #3: Create Release folder: You can create a new release folder or directly create a release here. To create a new folder, choose the “New Release Folder” from the menu or right click on the “Releases” root folder and choose “New Release Folder”. Enter the name and Click OK. The folder gets added to the hierarchical structure under Releases. Step #4: Create Release: Under the newly created folder, I am going to add a ‘New Release”. You can choose the “New Release” from the menu or right click on the root folder and choose “New Release” or choose Ctrl+R. Enter the Name. As you can see, a start date and end date are the required fields. There is a description box where you can enter any text and then you can upload any supporting documents under attachments. Enter the information as required and click OK. Step #5: The release gets added. Step #6: Adding cycles: The next step is to add cycles. Under the newly added release, the options to add a new release folder or release are disabled. You have options in the menu to add new cycle activated or the right-click menu has the option or Ctrl+Y keys can be used. Use one of these and choose to add a new cycle. Again name, start date and end date are mandatory items. Enter the same and click OK. Step #7: The cycle will now get added to the cycle. This is how the May and June release information from our table are going to look once it is all added to ALM. Step #8: There are some validations for entering the cycle dates. They have to fall within the range of the release dates under which the cycle is created. If not, a validation message gets displayed. Step #9: Once it is created. Choose the “May release” and observe its data. More information in these fields is going to get updated as and when we keep linking more requirements and in turn tests and defects. We will always retrace our steps backwards and see how each additional linking effects the former components. Step #1: Go to “Requirements->Requirements” option from the ALM sidebar. Step #2: Create new requirement folder. For consistency I am going to go with the name, ALM training- May release and June Release subfolders. Enter the name and click OK. Step #3: Once created, you can choose in the tree folder structure and add additional properties. Step #4: Adding Requirements: Click on “New Requirement” icon from the menu while choosing the folder under which you want to add the requirement. The author name gets auto-populated. Enter the name and choose the relevant requirement type from the drop-down. I am going to choose “Testing”. Step #5: Link the requirement to a cycle and release: Once you have added the requirement name and other details, you can now link it to any release and cycles as desired. You can do that by clicking on the “Target Release” drop down and selecting the release information. Since in our example this belong to the may release I am going to choose the same from the drop-down. Note: You can associate a requirement with more than one release. Step #6: To choose the Cycle. Click on “Target Cycle” drop down and choose the required Cycle. Since our login is a crucial function, I would like to perform it in every cycle. So I am going to map it to all 3 cycles under the May release. Here is how I do it. Step #7: You can then assign additional details like the priority, provide attachments and other details before you Submit. The requirement gets added. Step #9: For every requirement a ‘Req. ID” gets auto-generated. In this case, it is “7”. Step #10: Also there are other features like requirement traceability, test coverage, etc in the sidebar of the “Requirement Details” dialog. We will discuss all that in details once we finish understanding the end to end flow from releases/cycles-requirements-tests-test sets-defects. Now that we created one requirement and linked it with a Release and Cycle, let us see how this linking effect the “Release” and “Cycle” properties for the ones we created earlier. 1) Navigate back to “Management->Releases” from the sidebar. Tip: If the statistics don’t reflect your changes as soon as you access this page, hit the refresh button in the menu. 3) Notice the statistics section, it shows “1” for the “Requirements assigned to cycle”. It now clearly indicates how many requirements are associated with this cycle. 4) Same thing with the Release. Hit the refresh button if the statistics don’t get updated immediately. Remember, that ALM does not mandate that a requirement created be mapped back to a release or cycle. It is merely a best practice to do so and when done, you can completely leverage the ALM features to your benefit. The same thing applies to Tests. Once you create the tests you don’t necessarily have to link them back to requirement and/or release. But then, you will not be utilizing the tool its 100% if you don’t. 1) In real time projects, all the data i.e. the requirements and tests are created in either excel sheets or word documents instead of directly creating them in ALM. This is not a tool imposed pre-requisite but testing teams across different companies find this more comfortable. One of the reasons for this is that you can keep local copies of the data on your machine thus reducing the network overhead. 2) You can import the data (requirements or tests) into ALM from Microsoft Word or Excel. To do so, you will need Micro Focus ALM Microsoft Word Add-in or Micro Focus ALM Microsoft Excel Add-in respectively. 3) You can also integrate ALM with an email server to make sure automatic email alerts can be sent to concerned parties based on certain conditions. For example, when a new defect is logged in or there has been a status change of the defect etc. 4) While creating folders, releases and cycles make sure that you choose the right parent node. 5) ALM organizes and stores data in a Grid or tree form. I really hope this session is given you a tiny peek of what Micro Focus ALM can do for your project and how best you can manage all your testing related activities at one place. 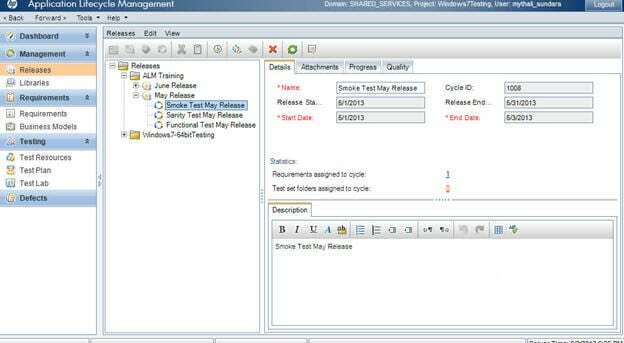 In next Quality Center Tutorial, we will see how to create and manage test cases. If you like this tutorial, please consider sharing it with your friends. Also, you can put your questions in below comment section. As always, we appreciate your feedback. Thanks much for this very useful and nice explanation. Thanks a lot,this tutorial is very help full my career. Really its a superb information which is very useful for job aspirants on testing. Very useful tutorial and very good explanation. I have windows 10 in my computer how can I install ALM in my computer. I downloded the ios files. When I started my installation it displays an error “Your operating system does not support ALM server”. How can I overcome this problem could any help me please? Can you explain the functionality of each requirement types? For every new item creation, only “Click on New” option is explained here which one can learn individually. After click on New symbol and adding a name, subsequent steps aren’t added. Creation of New Requirement/Folder in this tab asks Team Name and I have searched a lot for it but no go. How to create a New Team please explain. Now, in Step # 6, we are chosing a “Cycle” for the Requirements created. But, where were or how the ” TYPE OF TESTING “(as shown : Functional, Smoke & Sanitu) defined? Appreciate your feedback in advance. Is it possible to move a Cycle from one Release Folder to another Release Folder? i,e,. is it possible to ‘cut’ a Cycle from one Release and paste it in under another Release? I am proficient at different tool by experience and was starting to believe the only way to quickly learn is by trial and error method; Well this web site has proven me wrong. Because I did not have ALM software, I was almost four days behind the entire class, but I believe I will be able to be in level with most students just by following this web page for about six hours. Very nicely executed. Please rewrite the instructions again for the year 2017. Thank You. Thank you for the brief description about the Requirements and Release Cycle Management. I have 1 doubt, that all the requirements, release and cycles are created by ALM Admin/TL or Team Member. Can you please clarify about my doubt.